“Harima-no-Kuni Fudoki” has been formed by the orders of the official law on May, 713, which is the early days of the Nara Period. It was compiled in 715 and it was spread to many parts of Japan. Currently, Fudoki only remains in five areas. Those five areas are “Izumo, Hitachi, Hizen, Bunngo, and Harima. “Harima-no-Kuni Fudoki” is Japan’s oldest chorography. It describes the name origin, tradition and the quality of the land. It mentions that people had an abundant life over 1300 years ago. By reading this, you can understand the life, culture, nature, and transportation of this period. Kasai city is depicted as Kamogunn in the Harima-no-Kuni Fudoki. Kamogunn includes the current Kasai city, Ono city and Kato city. One of the most famous descriptions of Kasai City is the Tamaoka mount tombs’ Nehime story. Currently, there is a Kasai city mascot named Neppy. This Yurukyara Mascot was modeled after Nehime. Now, I would like to tell you the tale of Nehime. This is a sad ending, but Nehime pursued her true love until the end. Currently, Nehime is living in the hearts of the Kasai people. This tomb is the Tamaoka-Kofun seen in the present time. 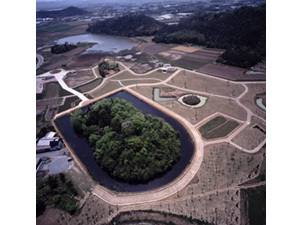 There are other tombs, such as the Kuwansu-kofun and the Dantozann-kofun placed nearby the Tamaoka Kofun. These tombs were constructed in the begging of the 5th century. All of these tombs are under the maintenance of Tamaoka Shiseki Park. Anyone is welcome to observe the ancient history. Also, the historical finding from the tomb is stored at the buried artifacts maintenance room. Harima-no-kuni Fudoki describes many things about Kasai city. We will establish an information board, so that many visitors can enjoy Kasai from this year. Please visit Kasai city where it has an interesting and romantic history.